Is NAS whisky the enemy? Age, they say, is only a number. But what if you take that number away? Is the current vogue for no age statement (NAS) Scotch whisky releases a blessing, or a curse? Tom Bruce-Gardyne hears two opposing views. 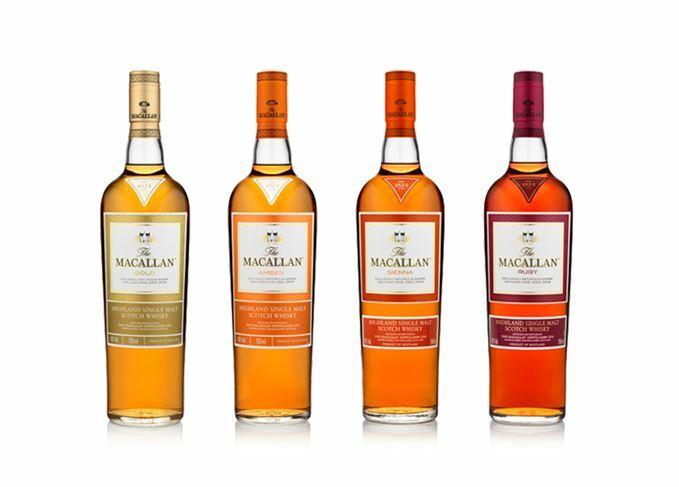 Broader canvas: Are NAS whiskies like this Macallan range the result of greater freedom for the blender? Today, with warehouses running short of mature stocks, the trade has been changing its tune. ‘Don’t look for the number – because you won’t find it’ seems to be the new mantra, as more and more distillers remove age statements from their brands. Of course, numbers on a label are only a crude indication of quality, but they do have one big advantage over names like Storm, Sienna and Superstition: they’re not a pure marketing construct. The NAS debate has recently become heated, with dark mutterings of ‘age drift’ on the blogosphere, as once proud 12-year-olds reappear minus their age, with maybe a dash of caramel to mask their youthful pallor, and with a higher price to boot. Diageo head of whisky outreach Dr Nick Morgan insists the issue is ‘only really important to the chatterati of single malts’, but plenty, including some in the industry, profoundly disagree. So here’s the question: Is removing age statements from single malts a bad idea? ‘Twenty years ago we were telling people what made Scotch whisky different from drinks like Cognac and rum, and we were putting an age statement on the label. It was an integral part of what we wanted the customer to understand they were buying. ‘I fully get the fact that sometimes there’s a time and place for non age-statement (NAS) whiskies. We have one, but for the most part – our other 70 whisky SKUs carry an age statement. If you’re spending £40 or more on a single malt, wouldn’t you want to know what’s in the bottle, rather than just the fancy name on the outside? ‘Those distillers pushing NAS whiskies talk of all the creativity it gives them, whereas in truth it’s entirely due to running out of stocks. It happened to us and we had to pull our 30- and 40-year-olds from the market for almost two years until we had enough. ‘Of course age isn’t everything and there are some very good young whiskies out there. But I think the thing that annoys consumers, and certainly annoys me, is the fact that people are bringing out NAS whiskies that are quite clearly younger than the whiskies they’re replacing, yet carry a 50% price increase. ‘It shows how the balance has tipped too far towards marketing, and unfortunately in big companies I don’t think those in marketing, sales and production actually speak to each other. ‘And spare a thought for the poor consumer. If you’ve only got one product and it’s an NAS whisky, they can obviously understand that, but if you’ve got 10 different NAS products, how do you explain the differences to the retailer, who then has to explain them to the consumer? ‘I do think we’re in danger of mucking it up for ourselves. We had a very clear and simple message, and now that message is definitely getting blurred. Compared to Cognac with its vague terms like XO and VSOP, I think age statements have been a huge strength for Scotch. To turn round and tell people your whisky now doesn’t have one seems like a big mistake. ‘The fact is, way back at the very beginning of Scotch whisky when you had farm distilleries, people didn’t put an age on their whisky. There are some extraordinarily fine whiskies that don’t carry an age statement, and just because you don’t have one doesn’t mean there aren’t some old and rare whiskies in the bottle. What it means is that you have greater scope and a bigger palette – like an artist, you have a broader canvas to play on. ‘Second, it’s very much about maturity, not age. If you’re using the very finest wood, some casks will reach a peak at different times from others. At Macallan, with our 1824 Series and 1824 Collection, we’ve really taken the shackles off [whisky maker] Bob Dalgarno. We’ve said he can pick any whisky we’ve got and use it at the peak of perfection, just like picking an apple off a tree when it’s perfectly ripe and not on some given date. ‘For example, our Macallan Rare Cask is about extremely rare whiskies chosen from 256 casks a year for a specific character or colour, irrespective of age. It’s about changing the paradigm and opening up endless possibilities for whisky makers to make beautiful whiskies. ‘Scotch whisky must be about supreme quality. It must be about us, as guardians of that, making sure that the right quality goes into the right bottle. It’s in all our best interests to produce superlative whiskies, whether they carry an age statement or not, and I genuinely don’t see any indication people in the industry are trying to hoodwink the consumer in any way. ‘On the contrary, I see everybody trying to make the best use of their stocks to produce interesting, innovative new products at a very high quality across a broader spectrum than hitherto. ‘“Non-age” does not equate to young whiskies. Some of the whiskies may be incredibly old and rare, and some may be more youthful to give vitality and zest to the whisky. So does the rise of NAS whiskies signify a great unleashing of creative power, with men like Bob Dalgarno freed from the tyranny of age to produce even more beautiful whiskies? Or is the industry simply being disingenuous in refusing to admit the truth: that it misjudged future demand for single malts 10-15 years ago, and is now having to make compromises due to holes in its inventory? It’s hoped that the £100m-plus plant will produce its first spirit before the end of 2017. Aged for 65 years and priced at £23,500, ‘Peerless Spirit’ completes The Six Pillars Collection.